Mick McCall completed his 11th season as the offensive coordinator and quarterbacks coach at Northwestern, where he has mentored an All-Big Ten quarterback in 6 of the last 9 years. He began his Wildcat tenure on Jan. 17, 2008. In 2018, Mick's offense helped the Wildcats capture the Big 10 West and a berth in the Conference Championship Game vs. Ohio State. Northwestern finished the regular season 8-1 in conference play, and with a 9 game road winning streak. For their efforts, four of Mick's players on offense earned All-Big 10 Conference honors. Mick helped develop QB Clayton Thorston, the only QB in Big 10 history to throw for over 10,000 yards and rush for TDs over his career. Thorston also holds NU records for most career wins (35), Big 10 wins (26), and passing TDs (58), among others. The Cats earned a berth in the 2018 Holiday Bowl against #17 Utah. in 2017, Northwestern’s offense under McCall ranked sixth in the league in passing offense, fifth in the league in rushing offense and fourth in total offense with 408 yards per game. The Wildcats also had the fourth highest scoring offense in the Big Ten, scoring just over 29 points per game. The 2016 season saw McCall and the Wildcats take strides forward with second-year signal caller Clayton Thorson at the helm. Thorson ranked fourth in the Big Ten with 3,182 passing yards and set a new NU single-season record with 22 passing touchdowns. His 3,182 passing yards were the most by a sophomore quarterback in program history and rank fourth on the NU single-season chart. The WIldcats offense ranked fourth in the league in passing offense and fifth in total offense with 398.2 yards per game. In addition to Thorson's breakout campaign, senior wide receiver Austin Carr became just the third player since 1990 to lead the Big Ten in receptions, receiving yards and touchdowns. Carr finished the 2016 campaign with a program record 1,247 receiving yards and tied the single-season record with 12 touchdowns. His 90 catches rank third in single-season history at NU. Carr combined with junior running back Justin Jackson as the only duo in the country to lead a conference in receiving yards and rushing yards as Jackson rushed for a career-high 1,524 yards and 15 touchdowns, becoming the first player in program history to eclipse 1,000-plus yards in three consecutive seasons. After a slow start to the season, the Wildcats' offense exploded for 38 points in a win at Iowa on Oct. 1 before defeating Michigan State a week later, 54-40, in what ended as the most points by allowed by the Spartans at home in history. The ’Cats eclipsed 38 points four different times during the 2016 campaign, including a 45-17 win at Purdue and 42-21 win over rival Illinois in the regular-season finale. McCall has been the architect of some of the most unique offensive systems in recent seasons. That includes 2012 when he utilized a pair of quarterbacks with contrasting styles, with both Kain Colter and Trevor Siemian taking charge of the offense throughout the season. Colter started 12 of 13 games and posted a passer efficiency rating of 129.3 while also running for 894 yards and a team-best 12 touchdowns. Siemian, meanwhile, was a lethal pocket passer and orchestrator of the two-minute offense, throwing for 1,312 yards and six touchdowns off the bench. McCall also took advantage of one of the nation's most dynamic running backs, inserting Venric Mark as the team's opening-day starter and helping the junior become NU's first 1,000-yard rusher since 2006. Mark racked up eight 100-yard rushing games and 12 touchdowns, leading an NU rushing attack that ranked fourth in the Big Ten with 226.3 yards per game. McCall's offense produced 31.7 points per game and a pair of second-team All-Big Ten selections in Mark and offensive lineman Brian Mulroe. McCall also successfully implemented the two-quarterback system in 2011 as returning All-Big Ten signal-caller Dan Persa shared snaps with the dynamic Kain Colter. McCall helped Colter post a 2-1 mark as the starter while Persa fully recovered from a ruptured Achilles tendon and, after Persa's return, employed Colter as a quarterback-running back-receiver hybrid. Colter compiled 673 passing yards, 654 rushing yards and 466 receiving yards and was involved in 18 total touchdowns on the year. Persa in 2011 led the conference in passing yards per game (237.6) eventually finished as the most accurate passer in NCAA history with a record-setting career completion percentage of 72.7. In all, Northwestern landed six offensive players on the 2011 all-conference teams: Persa, Colter, WR Jeremy Ebert, OL Al Netter, OL Brian Mulroe and Big Ten Tight End of the Year Drake Dunsmore. 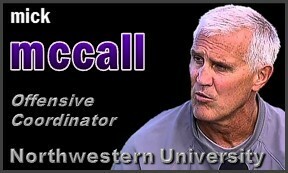 McCall helped NU to a 9-4 record in his first year in Evanston while dealing with a bevy of injuries to standout performers on NU's offensive unit. Quarterback C.J. Bachér finished 33rd in the nation and second in the Big Ten in total offense. When an injury kept for him out for two games, McCall tweaked the offense to allow Mike Kafka to break the Big Ten record for rushing yards by a quarterback with 217 at Minnesota. In 2009, McCall took advantage of All-Big Ten quarterback Mike Kafka's abilities to turn his offense in the Big Ten's top passing attack, ranking 13th in the country with 286.5 yards through the air per game. Kafka was selected in the fourth round of the NFL Draft by the Philadelphia Eagles after leading the conference in total offense (286.5 ypg), passing yardage (263.8 ypg), completion percentage (64.8), completions per game (24.5) and fewest interceptions thrown (2.44 percent) as a senior. McCall's offense was astounding in the season-ending Outback Bowl, gaining 625 total yards while contributing to 21 broken Outback Bowl records and an additional 11 tied during a dramatic 38-35 overtime loss for the Wildcats. Kafka's 532 yards through the air were a school record, while his 47 completions and 78 passing attempts were NCAA bowl records. Kafka's 98 offensive plays (78 pass attempts, 20 rushes) and the Wildcats' 115 total offensive plays were both NCAA bowl and NCAA FBS records. McCall spent the 2007 season as the offensive coordinator at Bowling Green State University, directing the Falcons' spread offense, which averaged over 400 yards per game (402.5 ypg). Prior to '07, McCall spent four years as BGSU's quarterbacks coach, and mentored All-Americans Josh Harris (2003) and Omar Jacobs (2004). McCall began coaching in 1979 at his alma mater, Southern Colorado, as the quarterbacks and running backs coach. He then spent five seasons (1983-87) as the running backs/tight ends coach and special teams coordinator at Idaho State. From there, he joined Oregon State (1988-90) as the Beavers' wide receivers and tight ends coach. After a successful 10-year stint (1991-2000) as the head coach at Douglas County and J.K. Mullen high schools in Colorado, McCall spent two seasons (2001-02) as the quarterbacks/running backs coach at Wyoming before moving to Bowling Green. At Mullen High School, he led the football program to a 68-17 record and a state championship in 1998, which earned him Denver Post Coach of the Year honors. Received his bachelor's degree in physical education from the University of Southern Colorado (now CSU-Pueblo) in 1979. Born April 6, 1957, McCall and his wife, JoAnne, have two daughters, Ashley and Brittany.